One way or another, I’m sure you are all familiar with the Dunning-Kruger effect. You might have heard about it under the label of confident idiots, describing a behaviour of an unskilled individual being unaware of the lack of a specific skill, instead assuming to have a skill-level that is even superior to the experts in the field. If you look around in your environment, family, friends, colleagues, you can probably spot the one or the other individual who would seem like a role model for Dunning-Kruger. Or think about the pointy-haired boss of Dilbert, who is the prototype character for this cognitive bias. and those with any imagination and understanding are filled with doubt and indecision. Recently, I came across an interesting consideration in Lessons from Mt. Stupid, in which Joseph Paris presents a very thoughtful narrative of Dunning-Kruger, plus a compelling sketch of the evolution of an individual’s wisdom over time. The following graph is a mild adaptation of that sketch. As almost everybody will know some individual who behaves like on top of Mt. Stupid, that part of the chart is an easy sell. While it defies logic, it certainly resonates with everyday experience that an individual’s confidence is not necessarily related to objective knowledge or wisdom. Hence it doesn’t come as a surprise that there must be some kind of humiliating realisation –the valley of despair– before the overly confident individual can reconcile his/her level of confidence with the actual level of wisdom. From then on, personal enlightenment paves the way toward a realistic and sustainable level of confidence. Through this lens, the Dunning-Kruger effect matches our experiences pretty well. But what I consider most remarkable about the graph above is its striking similarity to Gartner’s technology hype cycles. Once again, the following chart is a mild adaptation of the original hype cycle graph to allow for easier comparison. That similarity is not just in the curve itself, you find it in the labels as well, which are in part even identical. So where do those similarities come from? While Gartner’s hype cycle serves as a tool to analyse the real promises of specific, emerging (main information) technologies, the Dunning-Kruger effect describes the behaviour of an individual. At that first glance, these two fields don’t seem to have anything in common. Still, I don’t believe that the similarities are just accidental. Let’s see. and underestimate the effect in the long run. That brings in the “we“, i.e., a collective. And it brings in a time dimension. 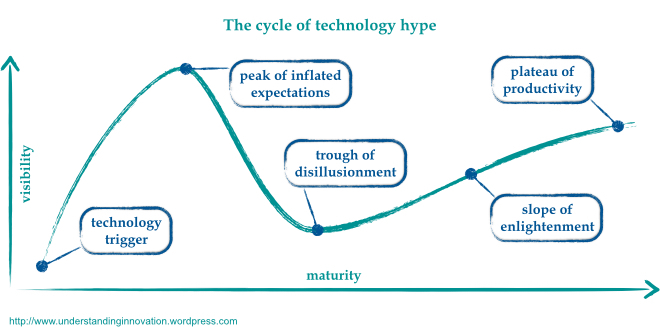 You might say that the hype cycle presents the perception that a collective has of an emerging technology, and how that perception changes over time, throughout the emergence of that technology. Moving back to Dunning-Kruger, it is quite clear that wisdom evolves over time as well. So both curves are presented over a time axis. 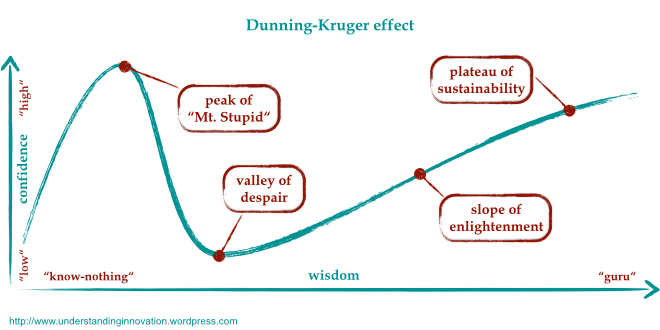 However, for Dunning-Kruger the vertical axis is for an individual, while the hype cycle works for a collective. And that already is the biggest difference between the two curves. No rocket science involved. Both curves showcase different aspects of the same human condition. Maybe try a thought experiment. Let’s start with Dunning-Kruger. Think of a specific individual and a specific emerging technology. For this case, Dunning-Kruger indicates how the individual’s knowledge of that technology will evolve over time. Then there is the reality that the technology itself evolves over time. Hence, early in that evolution it is really difficult to have realistic expectations of what that technology might be, become, or be used for. Instead, it is rather easy to be completely off the mark, which of course adds to the height of Mt. Stupid. At that point let’s shift over to the hype cycle. The collective addressed there is composed of individuals, who are subject to Dunning-Kruger by definition. But they are not all at the same stage of their travel around Mt. Stupid: some may be still climbing up, others are already descending, while yet others progress towards the slope of enlightenment. The question for the collective curve then is: where is each of the individuals on his/her personal travel? How far has each of them progressed towards wisdom? That’s where the diffusion of innovation comes in. Back in 1962, Everett Rogers presented his concept of how innovation is adopted in a society. He described five characteristic roles for individual adopters, and indicated the standard distribution of those roles in a society (2.5% innovators, 13.5% early adopters, 34% early majority, 34% late majority, and 16% laggards). Along this spectrum, and for a specific technology, the innovators with their very clear ideas have reached the plateau of sustainability, whereas the laggards still ascend Mt. Stupid. With that additional jigsaw piece, the overall picture takes shape. In the very early phases of a technology evolution, only very few people have thorough knowledge, whereas the majority is still on Mt. Stupid: the collective has inflated expectations. As technology evolution progresses, more and more individuals come down from the mountain and pass through the valley of despair: the collective is slowly moving over the peak. When technology matures further and gets adopted by the majority, the collective expectations move through the trough of disillusionment and get on the slope of enlightenment. Of course this should be a component of innovation literacy. We must learn to understand –and maybe even anticipate– the deviation between expected effects of technologies and the reality of technology impact. However, given that the human condition makes it difficult for each of us to realise the limitations of our own knowledge, we’ll have to live with temporary outbursts of hubris. There is no reason to be self-complacent. Everybody is a wise expert in only a few things, while still climbing Mt. Stupid in many, many others. We’ll just have to look in the mirror. And withstand the temptation to overestimate our own wisdom. Every single day. Claiming credit where credit is due… The graphic used for Dunning Kruger is my original graphic from September 2014 (or sooner). It was first used in an article I wrote, “Lessons from Mt. Stupid” published on my blog and on the Operational Excellence Society website. It is also used in my book, “State of Readiness”. I am not asking that this graphic be removed, but respectfully request that proper attribution be made. thank you very much for this important correction. You’ve done a really remarkable job that deserves the right attribution. I’ve changed the hyperlink and included your authorship in the text already.